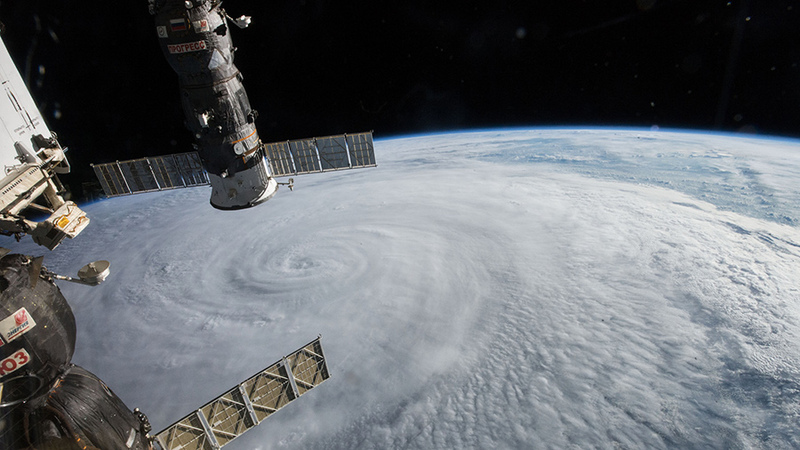 The International Space Station, with the docked Progress 60 resupply ship in the upper left, flies over Typhoon Soudelor in August. 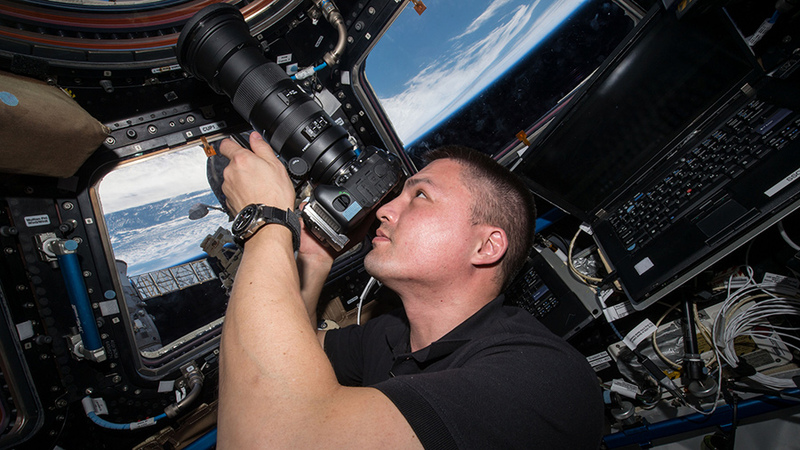 The six-member Expedition 46 crew worked on human research activities and unloaded cargo today. The three newest crew members — Flight Engineers Yuri Malenchenko, Tim Kopra and Tim Peake — continued familiarizing themselves with International Space Station systems and operations. Commander Scott Kelly used an ultrasound during the morning to scan Flight Engineer Sergey Volkov’s eyes. 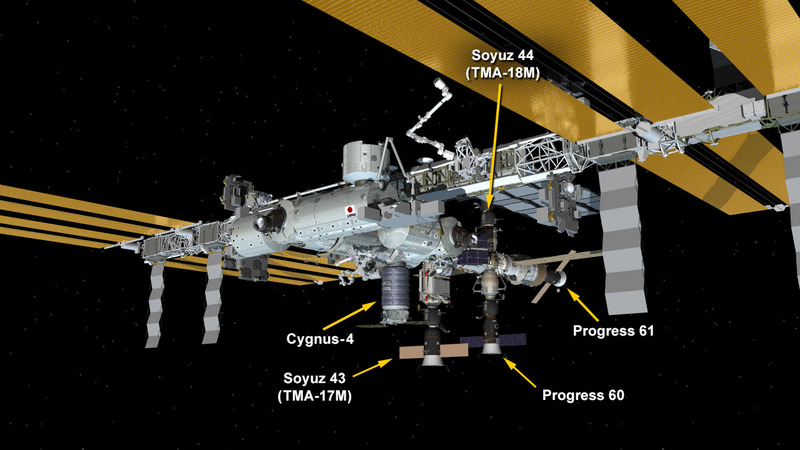 Kelly then joined new station residents Kopra and Peake and unloaded cargo from the Cygnus private space freighter. Kelly later installed radiation detectors in the Columbus lab module. Peake filled out a daily questionnaire for the Space Headaches study. Cosmonaut Mikhail Kornienko was in the Russian segment of the orbital lab getting the Progress 60 resupply ship ready for its undocking early Saturday morning. Malenchenko transferred gear and supplies from the new Soyuz TMA-19M spacecraft that arrived Tuesday. Malenchenko, who is on his fourth station mission, also photographed the condition of the Soyuz docking cone for inspection on the ground. Dec. 15, 2015: International Space Station Configuration. 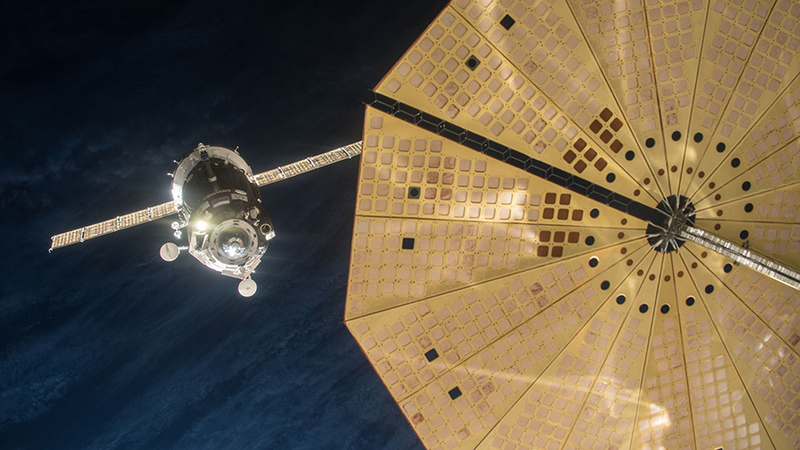 (Clockwise from top) The Soyuz TMA-18M spacecraft is docked to the Poisk mini-research module. 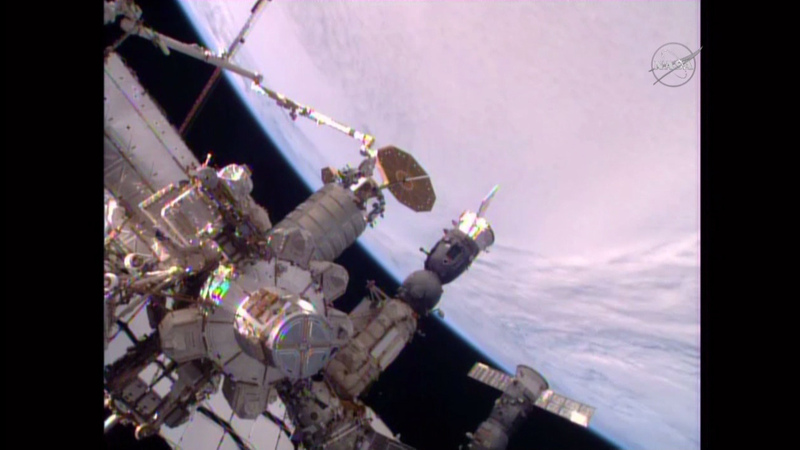 The ISS Progress 61 spacecraft is docked to the Zvezda service module. The ISS Progress 60 spacecraft is docked to the Pirs docking compartment. The Soyuz TMA-19M spacecraft is docked to the Rassvet mini-research module. 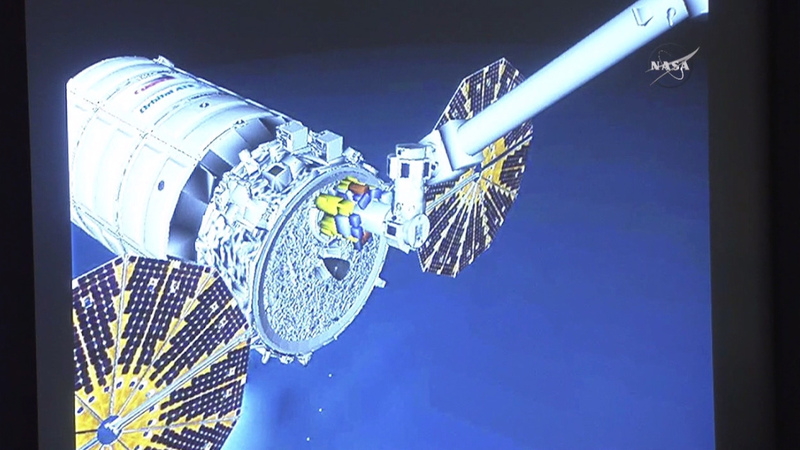 The Cygnus-4 cargo craft is berthed to the Unity module. The new Expedition 46 trio aboard the International Space Station is settling in for a six-month mission and getting right to work. They arrived Tuesday morning, had a quick safety briefing and rested up before their first full day aboard the orbital laboratory. New Flight Engineers Yuri Malenchenko, Tim Kopra and Tim Peake worked throughout Wednesday familiarizing themselves with station systems and emergency procedures. During the afternoon Kopra began unloading the new Cygnus private cargo ship while Peake worked on NanoRacks gear and life support hardware. Malenchenko began unloading science experiments, including the Biosignal human cell study, and other supplies from the new Soyuz TMA-19M spacecraft. One-Year crew members Scott Kelly and Mikhail Kornienko are over nine months into their mission aboard the station. Flight Engineer Sergey Volkov has been with the crew since September. Kelly and Volkov paired up for eye exams today as part of the Ocular Health study. Kornienko assisted Malenchenko with the Soyuz cargo transfers. He also explored how vibrations affect the station structure caused by crew activities such as spacewalks, vehicle dockings and exercise. ISS046e001535 (12/15/2015) — Cosmonaut Yuri Malenchenko manually docked the Soyuz TMA-19M spacecraft to the Rassvet module bringing he and astronauts Tim Kopra and Tim Peake to the International Space Station. The solar array of the Cygnus cargo craft is seen in the foreground. Orbital ATK’s Cygnus spacecraft lifted off at 4:44 p.m. EST on top of a United Launch Alliance Atlas V rocket en route to the International Space Station. At the time of launch, the International Space Station was traveling over the Atlantic Ocean, north of Bermuda. The cargo includes dozens of science and research investigations that will occur during Expeditions 45 and 46. 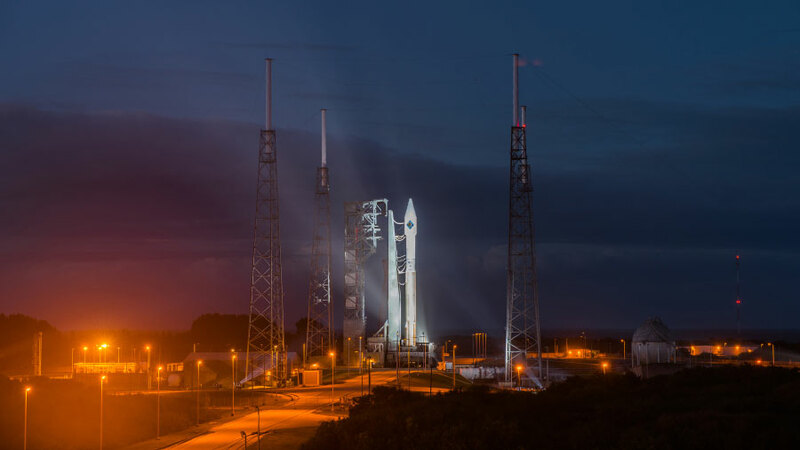 Countdown is continuing for today’s scheduled launch of the fourth Orbital ATK commercial resupply services mission to the International Space Station. 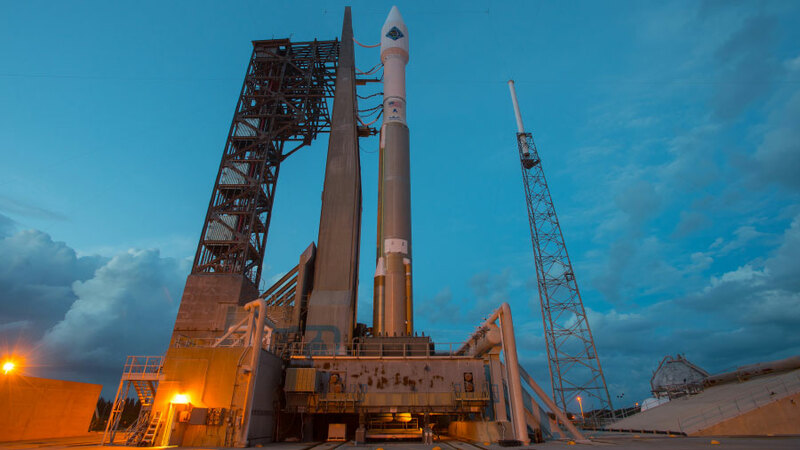 The Cygnus spacecraft is set to lift off on a United Launch Alliance Atlas V rocket from Space Launch Complex 41 at Cape Canaveral Air Force Station in Florida, carrying more than 7,000 pounds of supplies and science investigations. The chance for favorable weather at the 4:44 p.m. EST liftoff is 70 percent. Winds at the launch site have dropped dramatically in recent hours, but are predicted to increase slightly through the launch window. 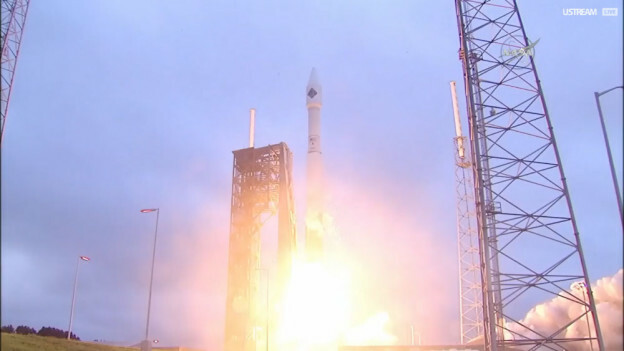 NASA television coverage has begun and can be seen at https://www.nasa.gov/nasatv. Significant countdown milestones are below. The cargo includes dozens of science and research investigations that will occur during Expeditions 45 and 46. 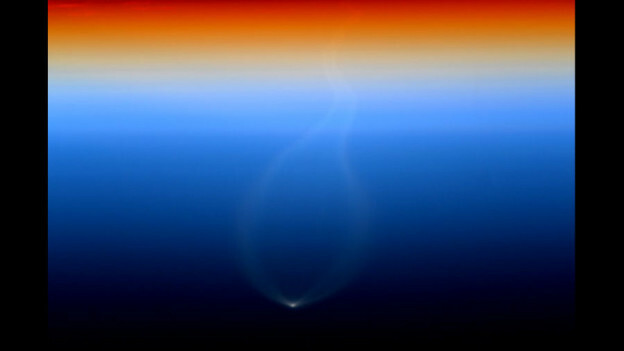 Science payloads will offer a new life science facility that will support studies on cell cultures, bacteria and other microorganisms; a microsatellite deployer and the first microsatellite that will be deployed from the space station; and experiments that will study the behavior of gases and liquids, clarify the thermo-physical properties of molten steel, and evaluate flame-resistant textiles. To join the online conversation about the Orbital ATK CRS-4 launch and the International Space Station on Twitter, follow @Space_Station and the hashtag #Cygnus.